That tower above the valley low. Greenery that grows into the misty sky above the clouds that drift quietly by. It is a place of mystic joy, a place of peace, in an earthly plane. An exotic land that spans the ancient space and time. It is one of a kind… envisioned by Universal Mind. Of the old and new China entwined. Is a haven for a heavenly lot. The Lord creates a place for spirits to play. And man to comprehend the holy scrolls. It is a place that takes your breath away. A place to kneel and pray. Today I am leaving for a trip to China. I will be gone for two weeks and will be back on line by July 4th. I am not sure how much access I will have to the internet but if possible I will post from China pictures and thoughts of this incredible experience. Once I return I will have a lot to catch up on… so keep on writing and I look forward to reading your post soon. 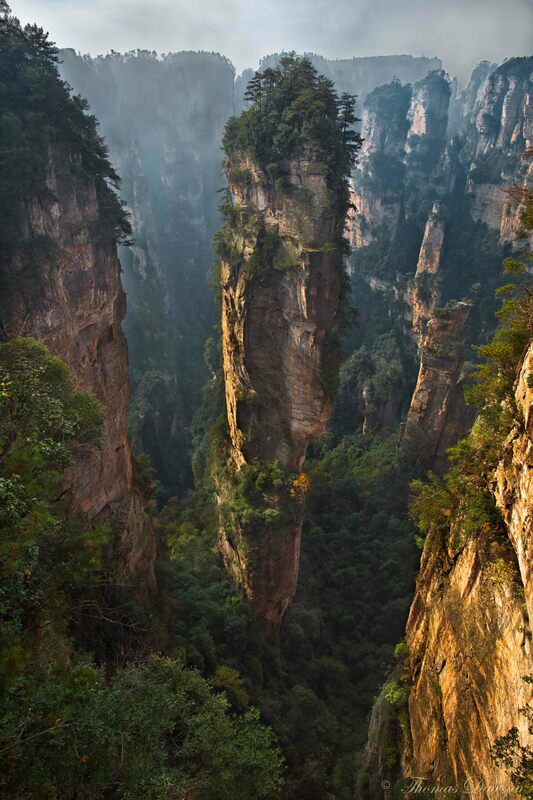 Today’s poem was inspired by this photo of Zhangiiajie Park in China. I first posted this poem in May 2012 and today with minor changes I hope you enjoy it. Hope you have a pleasant trip my friend, take care. So very beautiful, both the poem and the awesome picture! God bless!